FAQ – Is Name Brand Formula Better than Generic? Who doesn’t love a good deal? I am as much of a bargain hunter as the next Mom! However, there are few times in life when parents are willing to plop down loads of money than in early infancy. Baby formula companies know this and are happy to cash in! I often encounter this unspoken assumption that a name-brand formula must be better … and of course you want your baby to have the best. Well, I’m here to correct that, and to hopefully save you a few dollars! The ONLY thing that matters about a formula is the list of ingredients. The rest is literally just colorful packaging. I do have one major complaint about generic formulas. That is: often times, they do not list the ingredients on their website! For example, “Parent’s Choice” formula (The Wal-Mart Brand), and “Comforts for Baby” formula (a local generic brand in the Central US) only provide nutrition facts (number of calories and fat, etc) on their website, no ingredients! Thus, if you were trying to do research at home, you would be hard-pressed to feel confident choosing one of these formulas. Generic formulas often just advertise that they should be “compared to” a big name-brand. However, as we all know, baby formula is a VERY special type of human food. You cannot simply compare the calories, fat and protein grams between brands because this is all controlled by the FDA. Plus, it is the different sources of protein and carbohydrate that can really make a difference on your baby’s stomach! 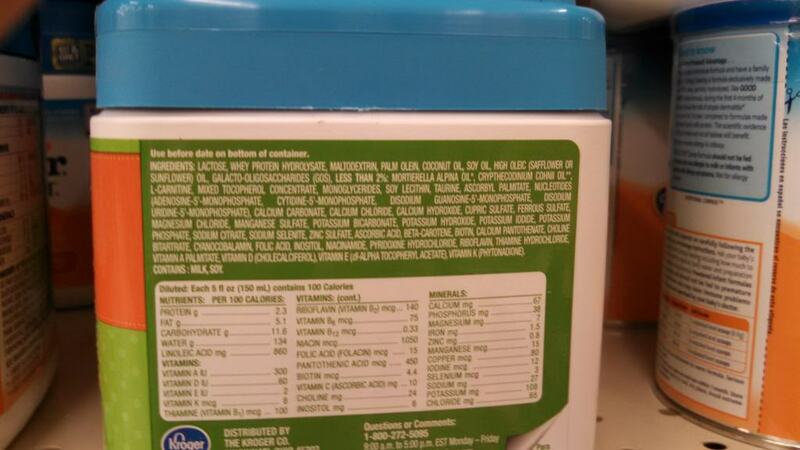 Thus, with formula (unlike adult food) you’ve got compare the ingredients between brands. You can’t just trust the marketing. 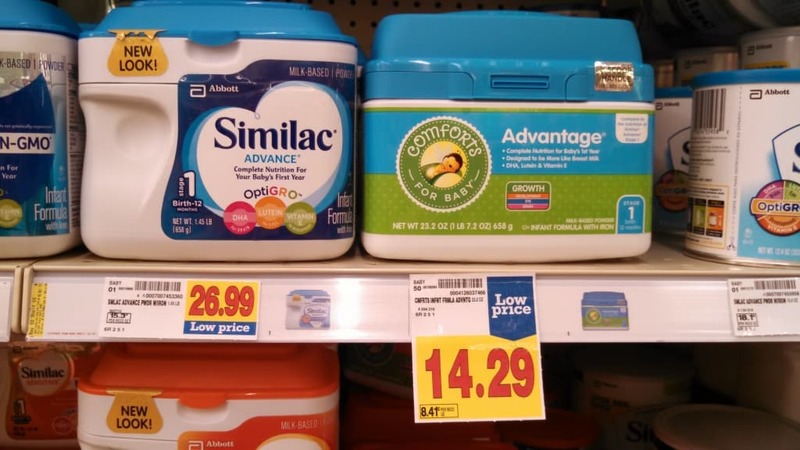 Example 1: “Comforts for Baby” Advantage formula seems to be the generic brand of “Similac” Advance formula. See what they did with the naming there? Clever. They are even placed on the shelf next to each other, and have the same color scheme! Again … very clever marketing. We’ve got an intact cow’s milk protein base with additional whey (Nonfat milk, and why protein concentrate). The carbohydrate source is lactose. The fat blend is standard (coconut, soy, high oleic safflower oil). This formula also has a prebiotic! (galacto-oligosaccharides), and DHA/ARA (C Cohini oil and M Alpina oil). * The fat blend is a bit different – The generic formula contains palm oil. The Similac does not. Palm oil is only something you want to think about if you’ve got a baby that was born prematurely, or a baby who has a constipation issue (learn more here). * The Similac brand contains lutein and lycopene, a micronutrient in vegetables like tomatoes. The generic band doesn’t have this. Honestly, this difference is not a huge deal to me. * The generic brand contains monoglycerides, which are added to make the texture right. The Similac brand doesn’t. In summary, there are very few differences. The palm oil may be a big deal in certain cases. Lycopene may be nice to have in formula (because it is found in breast milk) but it is not a required nutrient for baby. You as a parent would have to decide if no palm oil, and some lutein and lycopene is worth the $12.70 price difference. I’d probably decide no, and go with the generic. 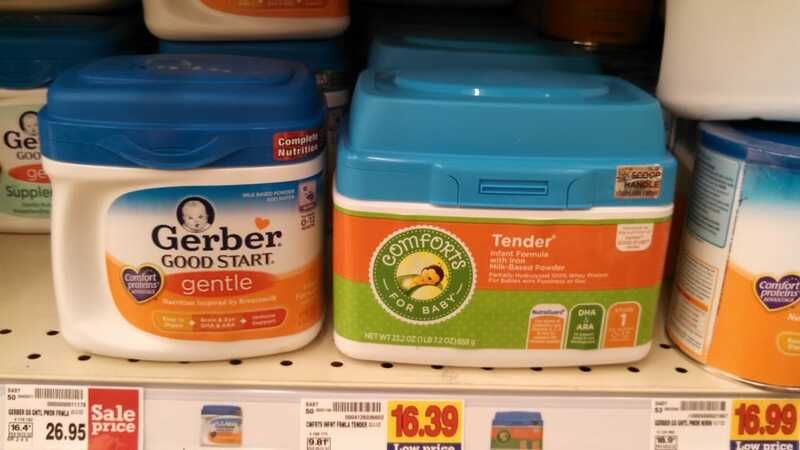 Example 2: “Comforts for Baby” Tender vs. “Gerber” Good Start Gentle formula. 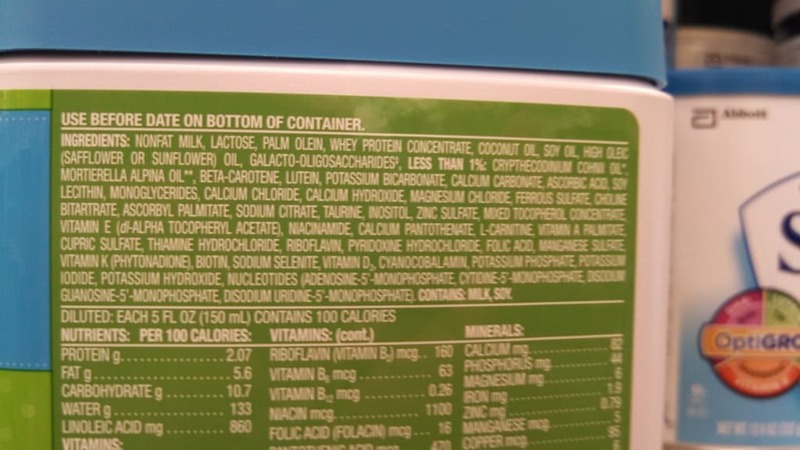 WHEY PROTEIN CONCENTRATE (FROM MILK, ENZYMATICALLY HYDROLYZED, REDUCED IN MINERALS), VEGETABLE OILS (PALM OLEIN, SOY, COCONUT, HIGH OLEIC SAFFLOWER OR HIGH OLEIC SUNFLOWER), LACTOSE, CORN MALTODEXTRIN, AND LESS THAN 2% OF: POTASSIUM HYDROXIDE, CALCIUM CHLORIDE, POTASSIUM PHOSPHATE, CALCIUM PHOSPHATE, SODIUM ASCORBATE, SODIUM CITRATE, CHOLINE BITARTRATE, 2′-O-FUCOSYLLACTOSE, M. ALPINA OIL, C. COHNIIOIL, MAGNESIUM CHLORIDE, TAURINE, NUCLEOTIDES (CYTIDINE 5′-MONOPHOSPHATE, DISODIUM URIDINE 5′-MONOPHOSPHATE, ADENOSINE 5′-MONOPHOSPHATE, DISODIUM GUANOSINE 5′-MONOPHOSPHATE), INOSITOL, FERROUS SULFATE, ALPHA-TOCOPHERYL ACETATE, MIXED TOCOPHEROLS, ASCORBYL PALMITATE, CITRIC ACID, ZINC SULFATE, NIACINAMIDE, CALCIUM PANTOTHENATE, L-CARNITINE, COPPER SULFATE, VITAMIN A ACETATE, RIBOFLAVIN, THIAMINE MONONITRATE, PYRIDOXINE HYDROCHLORIDE, MANGANESE SULFATE, POTASSIUM IODIDE, FOLIC ACID, PHYLLOQUINONE, BIOTIN, SODIUM SELENATE, VITAMIN D3, VITAMIN B12, B. LACTIS CULTURES, SOY LECITHIN. * The Gerber brand has a human milk oligosaccharide (HMO) prebiotic (the 2FL) vs the generic which has a fiber-based prebiotic (galacto-oligosaccharides). 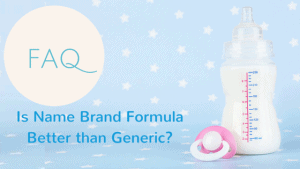 The research on HMO’s in formula is promising, but honestly, I’m not sure if it is worth the price difference – that depends on a lot of individual factors about your baby. * The Gerber has a probiotic in it, but the generic does not. No biggie since it’s really easy to add your own probiotic at home. In summary, I think the generic is a really similar formula in the big factors (the fat, protein, and carb). PLUS – the generic is $10 cheaper! Just think – after 2 containers, you’ve saved enough for a new pair for shoes!! I’ll add a note here. On this site, I recommend Gerber Good Start as a starting formula. I recommend name-brand formulas because I have readers from all over the country and generic brand availabilities differ by region. 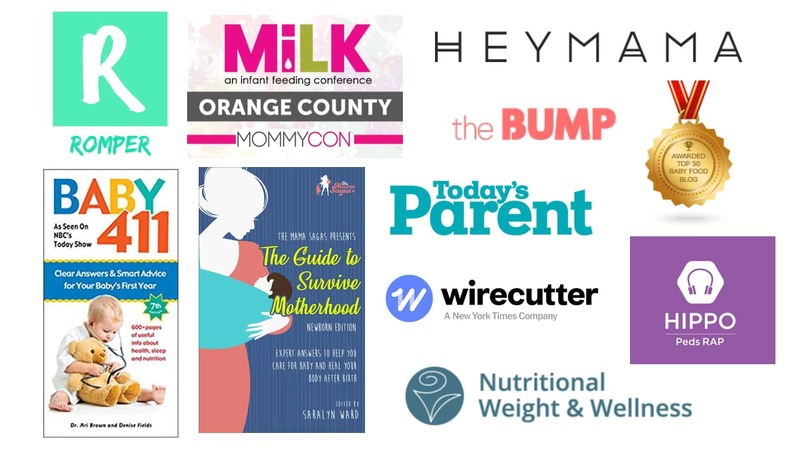 So, if you are in a region that offers “Comforts for Baby” formula, their Tender formula meets all these criteria and would save you lots of money! Fabulous! 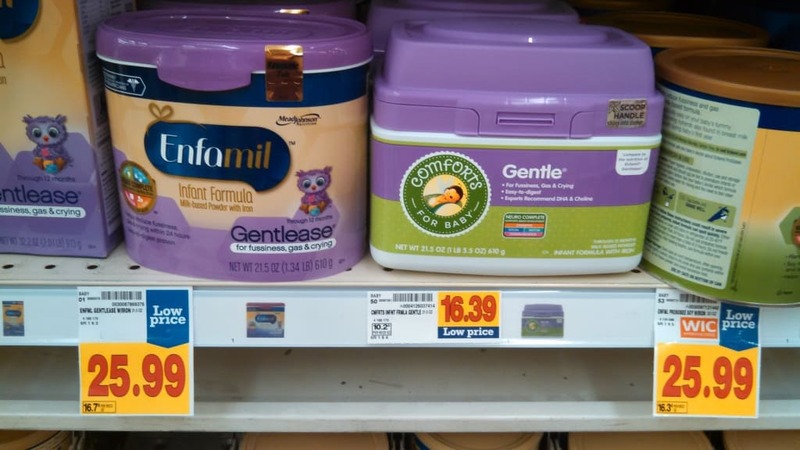 Final Example: “Comforts for Baby” Gentle vs. “Enfamil” Gentlease. The Enfamil brand proteins are all partially hydrolyzed, whereas the generic brand contains intact milk protein and partially hydrolyzed whey protein. This is a very interesting difference. There’s lots of research about the benefits of partially hydrolyzed proteins for certain babies (like kiddos at risk for allergy), but this research is relevant to formulas like Gentlease, where all the proteins are partially hydrolyzed. A blend of partially hydrolyzed and intact proteins would likely not provide the same benefits and protection – so this difference is huge. 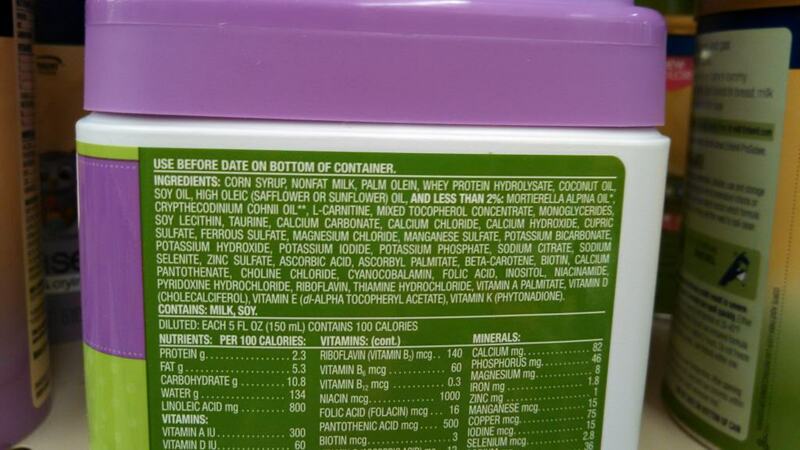 The generic brand may have a little more coconut and a little less soy oil in the fat bland … no biggie there. The generic brand has both monoglycerides and soy lecithin – which are added to enhance texture. The Enfamil does not. This is likely not a big deal either. This is a prime example of why you can’t just trust they are the same because the manufacturer has put them in the same purple-color box! Don’t trust that generic brand baby formula is exactly the same as the name-brand formula it is competing with! The total number of calories and grams of fat, protein, and carbs will be the same. BUT, there are often small differences in the list of ingredients that can mean big difference to a baby’s tolerance. Don’t assume the name-brand is better! Sometimes the differences in ingredients stack up in favor of the generic brand! Be a savy shopper. Go to the store prepared to spend a long time in the formula aisle looking at the back of all the cans before you make your decision. I hope that helps clear up some confusion, and maybe it will make you feel better about considering a generic brand formula. We’re all just trying to give our babies the best … and you are doing a great job! Do you have a generic brand formula that you love? Let me know what it is (and where you are from). I’d love to check it out!